Metabolic Activation of Polynuclear Aromatic Hydrocarbons deals with the metabolic activation of polynuclear aromatic hydrocarbons and covers topics ranging from the cytotoxic, mutagenic, and carcinogenic effects of arene oxides to the role of secondary metabolites as ultimate carcinogens. The mechanism of binding of metabolites derived from polynuclear hydrocarbons to key cellular sites is also discussed. 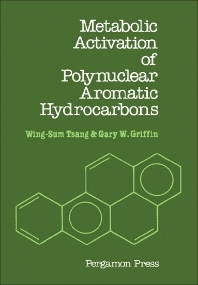 This book begins with a brief review of the early work on the mechanism of chemical carcinogenesis by polynuclear hydrocarbons, followed by a detailed survey of pertinent literature in the field. The cytotoxic, mutagenic, and carcinogenic effects of arene oxides are analyzed, along with the solvolytic and nucleophilic reactions of benzo[a]pyrene (BaP) diol epoxides. The discussion then turns to the carcinogenicity, mutagenicity, and cytotoxicity of BaP metabolites; the "Bay-region" theory of carcinogenic activity and perturbational molecular orbital theory; and the mechanism of binding of metabolites derived from polynuclear hydrocarbons to key cellular sites. Research on polycyclic aromatic hydrocarbons pertaining to the "Bay-region" theory is also presented. This monograph will be of interest to chemists, biochemists, and oncologists.